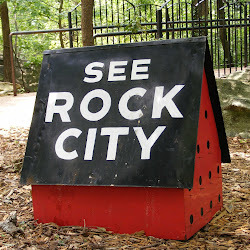 If you haven’t visited Rock City in a while, now is the time to do it. The Fifth Annual Rocktoberfest is happening now. I always make a point to visit Rock City during the Festival of Lights, but this time of year is georgous. Pack up the family and take the trip up Lookout…enjoy the views!!! Check out the link for more details.